Russian knapweed is a deep-rooted, herbaceous perennial that spreads by seed and vegetative root buds. The plant is characterized by its extensive root system, low seed production, and persistence. Russian knapweed is common throughout western United States, infesting about 1.2 million acres of rangeland, cropland, pastures, and disturbed sites. The weed is poisonous to horses but is usually avoided by grazing animals. Dense monocultures of Russian knapweed reduce desirable vegetation through a combination of competition and allelopathy. Russian knapweed stems are about 18 to 36 inches tall, and new growth is covered with soft, short, gray hairs. Lower stem leaves are narrowly oblong to linear and deeply lobed, and upper leaves are oblong, toothed, and become progressively smaller toward the tip. Flowers heads of Russian knapweed are urn-shaped with bracts that are greenish at the base and have a papery tip. Flower color is light pink to purple. Field trials have been conducted to assess the efficacy of Milestone® herbicide compared to various herbicide treatments on Russian knapweed. Results of these trials show that Milestone at 5 to 7 fluid ounces per acre (fl oz/A) provides excellent Russian knapweed control when applied from late bud to after foliage has died in fall. Milestone is taken up by the foliage, root crown, and roots allowing for an extended application timing into late fall. The graph below shows percent Russian knapweed control with Milestone, Tordon® 22K herbicide and Transline® herbicide applied at two application timings summarized over 11 different locations in five states (Figure). Russian knapweed flowers. Photo by Steve Dewey. Russian knapweed roots are black or dark brown in color and develop shoots from root buds, enabling the plant to spread rapidly. Photo BY Washington State Weed Board. Dense monocultures of Russian knapweed reduce desirable vegetation through a combination of competition and allelopathy. Photo BY La Plata County, colorado. Figure. Russian knapweed control one year after treatment with Milestone® applied at late bud to bloom growth stage and in fall. Symptoms of herbicidal activity on Russian knapweed (browning and curling of plants) following application of Milestone may be slow to appear especially in post-flower and fall treatments. 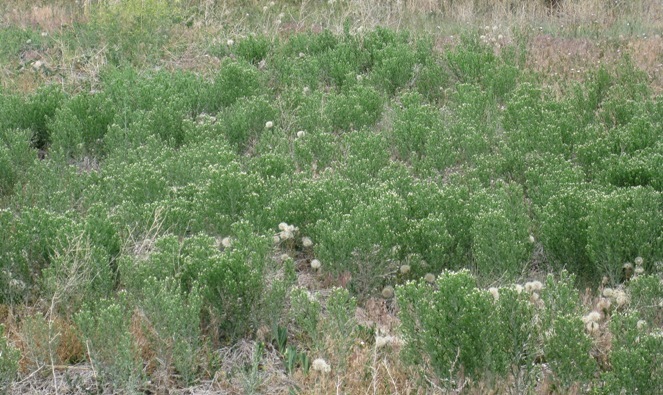 Russian knapweed control may not be evident until the growing season following application. The extensive root system makes long-term control of Russian knapweed difficult to achieve. Mechanical control is not effective and tillage will spread root fragments to non-infested sites. Mowing at late bud growth stage will reduce seed production for that year, but will not control the plant. Burning is not known to impact the plant. Desirable vegetation that can compete with Russian knapweed will improve the long-term success of an herbicide treatment. Field trials on establishment of desirable grasses in Russian knapweed infested sites have been conducted by Colorado State University. Results of this study are available at http://bit.ly/11fvd0B. Milestone herbicide is not registered for sale or use in all states. Contact your state pesticide regulatory agency to determine if a product is registered for sale or use in your state. When treating areas in and around roadside or utility rights-of-way that are or will be grazed, hayed or planted to forage, important label precautions apply regarding harvesting hay from treated sites, using manure from animals grazing on treated areas or rotating the treated area to sensitive crops. See the product label for details. State restrictions on the sale and use of Milestone apply. Consult the label before purchase or use for full details. Tordon 22K is a federally Restricted Use Pesticide. State restrictions on the sale and use of Transline specialty herbicide apply. Consult the label before purchase or use for full details. Always read and follow label directions.